← Moments from Last week’s Dog Night. Demolition actives will be complete the first week of August with site restoration actives being complete by early October 2014. During the demolition Lot 25, the northwest side of McClintock, will be closed and used for truck and equipment access to the demolition site. 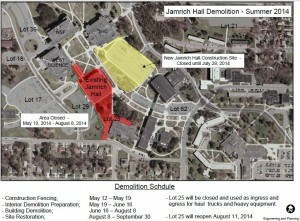 Lot 25 will reopen prior to the start of the Fall 2014 semester. Pedestrian access will remain open between the new Jamrich Hall construction site and the existing Jamrich Hall demolition site for the duration of the summer. Parking in Lot 11 (unmarked, just off the top of the aerial photo) is unaffected. For parking on campus, refer to this link.